In his blog here, “Generations,” for SCMS, Chuck Kleinhans said that at his first SCS meeting in the mid-70s “the meeting had two concurrent sessions: the Film Historians on one floor and everything else below.” History still has a big place at SCMS, albeit more dispersed, but I, too, heard and thought about it a great deal since my arrival on Wednesday. At the panel “Queer Asian Affairs,” Bliss Cua Lim used images of Filipino ghostly Aswangs to focus our attention on the cohabiting queer modernities of the past and present, while Fiona Lee attended to spectral communists made visible in the present nation/time of Malaysia: “The nation is a mistranslation of time as space.” In the panel “The Remediation of Race,” Patty Ahn, too, felt the tug of ghosts, albeit it in the more ephemeral way that YouTube must repurpose the Kim Sisters, and everything else, without any content other than the “community” that posts and watches. Meanwhile, Alexander Cho tried to catch a glimmer of the past in Tumblr’s waterfall of gifs of mixed-raced individuals by thinking through loops and refrains. : “the currency is image and time and repetition.” During the Q and A, I asked us to think about loops and shifts as well: a repeat and a slight change or maybe a Glitch (and here a shout out to the great Glitch panel and Laura Mark’s illuminating use of the rug to help us see, in the “Arab Glitch,” the mess and beauty of slight variation and change). The “community” that can be found, or made (but not usually mobilized), by attending to images of and from our past was a concern at the thoughtful and loving panel, “Marlon Riggs’s Tongues Untied at 25.” Racquel Gates and Rhea Combs helped us see some possible hauntings of Riggs’ influence in the contemporary media forms of artists as diverse as Byron Hurt, Rodney Evans, or Frank Ocean. E. Patrick Johnson spoke about making past films present to our students; andCornelius Moore and Vivian Kleiman reminded us of the contexts in which Riggs’ powerful films were made. Kleiman explained that Riggs had made Tongues Untied to show “in three bars”: places where black gay men met at the time, one in San Francisco, one in Oakland, and one in DC. Meanwhile, Moore, who is Riggs’ distributor at Third World Newsreel, told us that a complete edition of Riggs’ works was newly available online. During, and after the panel, he a I considered what gets done when people watch activist films alone on their computers, and not in the bars and rooms and other co-inhabited places where they were intended to be seen and used (as Combs informed us was Riggs’ primary motivation for his videomaking: to be used by organizations, businessmen, students, teachers). The gif(t) of past images on the internet is a loop and a shift that may lead to a flicker of remembrance, or a charge or recognition, but as I’ve often worried, it’s hard to make a hard stop: to listen, to talk, to love, and act if things are lost in Tumblrs’ endless present. In the torrent, we look to the past because it feels like it might better stick. This certainly seems to be the thrust of the “New Video Studies” that was the subject of the panel, “Video Studies.” Most of the young scholars on the panel, and in the room, are studying the material and other traces of a tawdry object lost to their childhood—the tacky VHS tape, and its many cultural manifestations—that Charles Acland so generously shook and rattled for us. And yet it was just this nostalgic, affective, and inspiring freeing of the past that was what David Oscar Harvey so boldly tried to unmake in our Unauthorized Conversation about HIV/AIDS held yesterday on a platform near the Registration area. Attending to the past of AIDS leaves us with hard-won words and images that are not quite descriptive of our experience today. This is never to say that we can’t and don’t learn from the past—this is our job as scholars and teachers (please see all the work I’ve cited above)—but Harvey insists (at least for us activist academics) that there is another, harder job still: to also keep us attentive to the present, ever more lost as it seems to be in a wash of glitchy gifs of the just-not-now and just-not-exactly-again-or-then. Marty Fink reminded us that academic conferences are one of the few places where the then and now (the older and younger; past and present ideas and images) can cohabit lived space, explaining her particular sadness at an opportunity lost (and then more powerful regained, in part) when our inter-generational workshop on the Silence of AIDS was not selected by the programming committee and therefore she (and we) were not gifted the opportunity, this time, to have dialogue with Tom Waugh, Gregg Bordowitz and Bishnu Gosh. But please, do follow the gift of the lost present of the wash of our just-past conversation on our Tumblr, or read more about the need for an AIDS NOW on Theodore Kerr’s Tumblr, U Ought to Know. 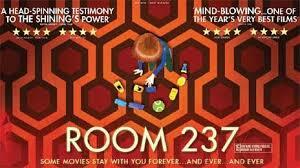 Natalie’s film is an inspiring mix of digital storytelling and artistic vision. Hope to see New Yorkers there! “How can we understand this moment of ‘AIDS Crisis Revisitation’, exemplified by the success of films like United in Anger and How to Survive a Plague. 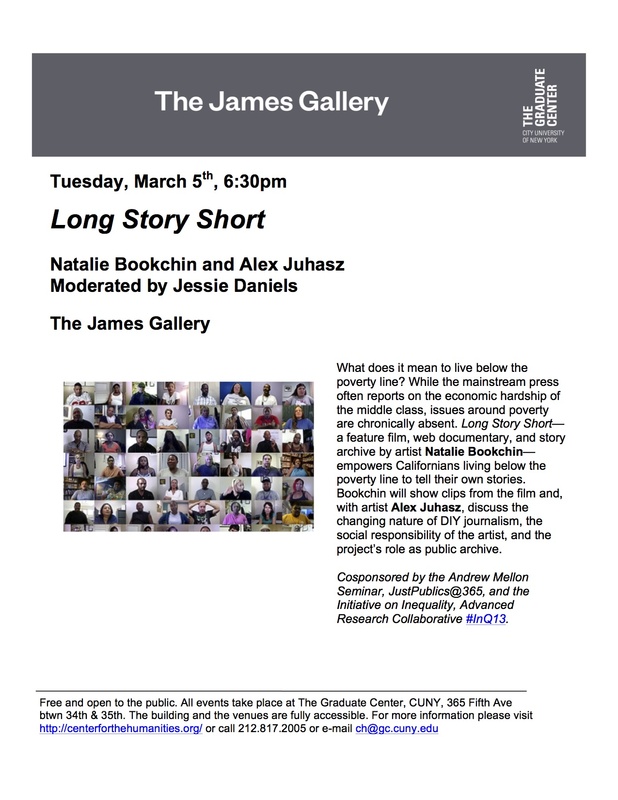 Video artist, activist, and academic Alexandra Juhasz provides some insight. Making and thinking about AIDS activist video since the mid 80’s, Juhasz coined the term “Queer Archive Activism”. In this first of two blog post Visual AIDS interviews her about her term and in the next post we flesh how Queer Archive Activism works in the world. Visit Alexandra Juhasz’s website. see my answers on Visual AIDS’ website! “Although the day is titled, A Day With(out) Art, the opposite will be true Saturday (Dec. 1) at the Palm Springs Art Museum. The museum will present a series of art forms to coincide with the World Health Organization’s World AIDS Day, which began in 1989. Admission is free. Robert Atkins, co-founder of Visual AIDS, which created A Day With(out) Art 24 years ago as a day to use art to raise awareness and honors those who have died of AIDS, will lecture on In Mourning and In Rage as part of the day’s theme: – In Memoriam: Loss, Identity and History in the Age of AIDS. The schedule of events is here. 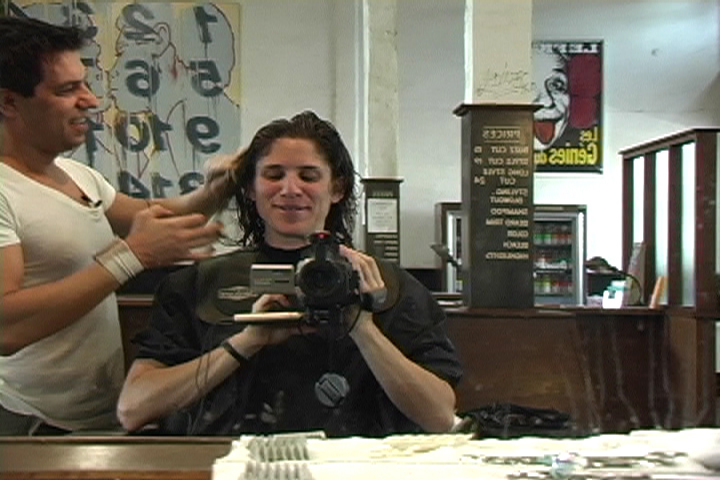 Alex and Michael, at Rudy’s Barbershop, Silverlake, still from Video Remains.